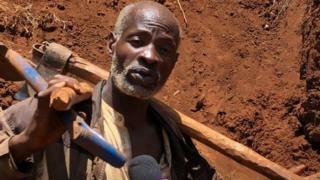 A man in Kenya has told the BBC he decided to dig a road by hand through thick bush to nearby shops to spare the suffering of his fellow villagers. Using a hoe, spade and axe, Nicholas Muchami has so far cleared 1.5km (one mile) in six days – and has a short way to go to complete the road. The road is just wide enough for vehicles to drive along.